Squamous cell cancer is the second most common type of cancer in the United States. Squamous cell skin cancer affects the epidermis, the top layer of skin. 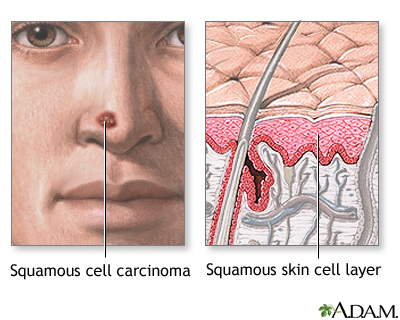 Squamous cell cancer may occur in undamaged skin. 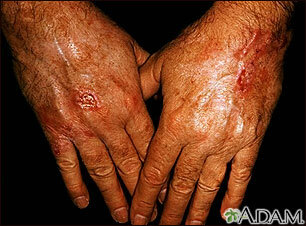 It can also occur in skin that has been injured or inflamed. Most squamous cell cancers occur on skin that is regularly exposed to sunlight or other ultraviolet radiation. 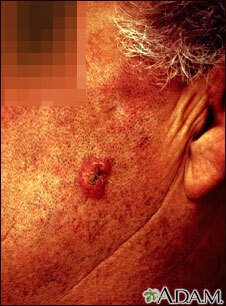 The earliest form of squamous cell cancer is called Bowen disease (or squamous cell carcinoma in situ). 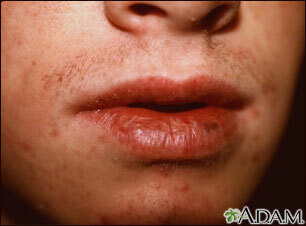 This type does not spread to nearby tissues, because it is still in the outermost layer of the skin. A keratoacanthoma is a mild type of squamous cell cancer that grows rapidly. A weakened immune system, especially in persons who have had an organ transplant. Squamous cell cancer usually occurs on the face, ears, neck, hands, or arms. It may occur on other areas. The main symptom is a growing bump that may have a rough, scaly surface and flat reddish patches. The earliest form (squamous cell carcinoma in situ) can appear as a scaly, crusted, and large reddish patch that can be larger than 1 inch (2.5 centimeters). A sore that does not heal can be a sign of squamous cell cancer. 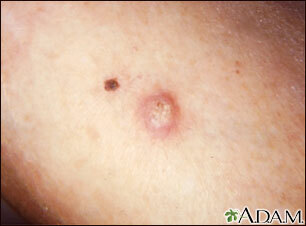 Any change in an existing wart, mole, or other skin lesion could be a sign of skin cancer. Your doctor will check your skin and look at the size, shape, color, and texture of any suspicious areas. If your doctor thinks you might have skin cancer, a piece of skin will be removed. This is called a skin biopsy. 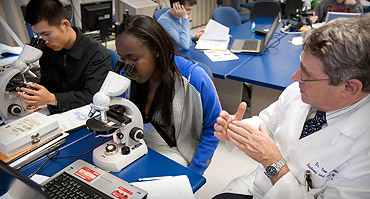 The sample is sent to a lab for examination under a microscope. A skin biopsy must be done to confirm squamous cell skin cancer or other skin cancers. Treatment depends on the size and location of the skin cancer, how far it has spread, and your overall health. Some squamous cell skin cancers may be more difficult to treat. Excision: Cutting out the skin cancer and stitching the skin together. Curettage and electrodessication: Scraping away cancer cells and using electricity to kill any that remain. 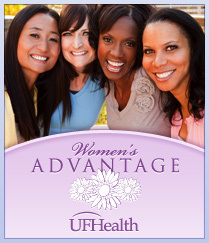 It is used to treat cancers that are not very large or deep. Cryosurgery: Freezing the cancer cells, which kills them. This is used for small and superficial (not very deep) cancers. Medicines: Skin creams containing imiquimod or 5-fluorouracil for superficial squamous cell cancer. Mohs surgery: Removing a layer of skin and looking at it immediately under a microscope, then removing layers of skin until there are no signs of the cancer, usually used for skin cancers on the nose, ears, and other areas of the face. Photodynamic therapy: Treatment using light may be used to treat superficial cancers. Radiation therapy: may be used if squamous cell cancer has spread to organs or lymph nodes or if the cancer cannot be treated with surgery. How well a person does depends on many things, including how soon the cancer was diagnosed, the location, and whether or not you have a weakened immune system. Most of these cancers are cured when treated early. Some squamous cell cancers may return. 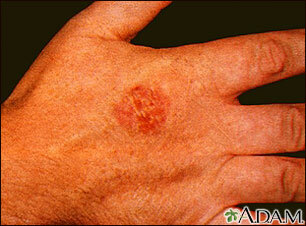 There is also a risk that squamous cell skin cancer may spread to other parts of the body. Also call your provider if a spot becomes painful or swollen or if it starts to bleed or itch. The American Cancer Society recommends that a provider examine your skin every year if you are older than 40 and every 3 years if you are 20 to 40 years old. If you have had skin cancer, you should have regular checkups so that a doctor can examine your skin. You should also check your own skin once a month. Use a hand mirror for hard-to-see places. Call your doctor if you notice anything unusual. Apply sunscreen with sun protection factor (SPF) of at least 30, even when you are going outdoors for a short time. Look for sunscreen that blocks both UVA and UVB light. Apply sunscreen at least 30 minutes before going out. Follow package instructions about how often to reapply. Be sure to reapply after swimming or sweating. Use sunscreen in winter and on cloudy days, too. Ultraviolet light is most intense between 10 a.m. and 4 p.m. So try to avoid the sun during these hours. Protect the skin by wearing wide-brim hats, long-sleeve shirts, long skirts, or pants. You can also buy sun-protective clothing. Avoid surfaces that reflect light more, such as water, sand, concrete, and areas that are painted white. The higher the altitude, the faster your skin burns. Do not use sun lamps and tanning beds (salons). Spending 15 to 20 minutes at a tanning salon is as dangerous as a day spent in the sun. Habif TP. Premalignant and malignant nonmelanoma skin tumors. In: Habif TP, ed. Clinical Dermatology: A Color Guide to Diagnosis and Therapy. 6th ed. Philadelphia, PA: Elsevier; 2016:chap 21. National Cancer Institute website. PDQ Skin cancer treatment. www.cancer.gov/types/skin/hp/skin-treatment-pdq#section/_222. Updated July 11, 2017. Accessed August 28, 2017. 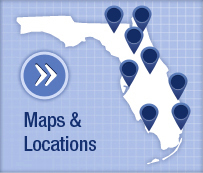 National Comprehensive Cancer Network website. NCCN Clinical Practice Guidelines in Oncology (NCCN Guidelines): Basal cell skin cancer. Version 1.2017. www.nccn.org/professionals/physician_gls/pdf/nmsc.pdf. Updated October 3, 2016. Accessed August 28, 2017. US Preventive Services Task Force, Bibbins-Domingo K, Grossman DC, et al. Screening for skin cancer: US Preventive Services Task Force recommendation statement. JAMA. 2016;316:(4)429-435. PMID: 27458948 www.ncbi.nlm.nih.gov/pubmed/27458948.